Director of the IfM Centre for Science, Technology and Innovation Policy (CSTI), Dr Eoin O'Sullivan, outlines the implications of an emerging next production revolution and explores how governments around the world are starting to prepare for it. Manufacturing is changing. New technologies are radically altering not only how we make things, but how we innovate. As manufacturing systems, technologies and innovation activities become more complex, distributed and interdependent, policy makers around the world are looking for new ways to ensure national competitiveness for the so-called ‘next production revolution’. What is the next production revolution? New technologies such as industrial digitalisation technologies (Internet of Things, Big Data, cyber-physical systems, for example), biomanufacturing, nanomanufacturing, advanced materials and novel production technologies (such as 3D printing), are expected to reshape production and drive disruptions across entire value chains. 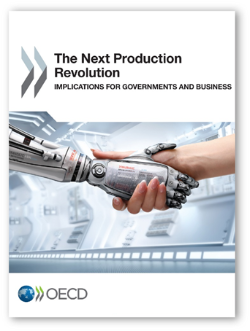 The OECD coined the term the ‘next production revolution’ to describe the impact these new developments will have on manufacturing systems. What does it mean for governments and industry? Change on this scale will present many challenges and opportunities). Some areas which have already been identified as needing attention include the need for new infrastructure, new skills, new business models, and new efforts to ensure cyber-security, privacy and customer protection. In particular, there will be a need to define and invest in new manufacturing R&D priorities, programmes and institutions. The increasingly complex ‘systems’ nature of manufacturing poses a significant challenge to policy makers. Manufacturing in the twenty-first century cannot be understood by analysing individual sectors or technologies alone. Many of the most valuable manufactured products are themselves complex systems, made up of different technological components, produced by advanced ICT-enabled process technologies, and reliant on complex, interdependent supply networks. The ‘digitalisation of manufacturing’ is not only disrupting how manufacturing firms do business, it promises to reshape national manufacturing systems and redefine sources of national competitive advantage. "Some of the most potentially disruptive technologies are based on convergence between science and engineering research domains." New digital technologies are radically altering the ways countries make things, and even how they innovate new products and services. In an era of ever more complex, distributed and interdependent supply chains, new ICT and data analysis tools offer new ways to organise and manage manufacturing. Furthermore, these systems are not only responding to rapid technological change, they are also being shaped by powerful social and economic drivers such as changing demographics, climate change and energy security. They also rely on the availability and combination of factors that are vital to the rest of the economy: labour, knowledge, natural resources and capital. To add further to the complexity, product and process R&D is also becoming increasingly dispersed and interdependent. If nations do not develop strong connections between their science and engineering research base and their industrial manufacturing activities, the risk is considerable. Not only could they lose their ability to translate these new technologies into high value production within their economies, they also risk losing the ability to innovate the next generation of high value manufacturing products. To compete effectively, therefore, national economies require industrial-innovation systems that can respond to emerging high-value industrial opportunities with the right combinations and clusters of technological R&D, skills, institutions and infrastructure. Three key themes which are emerging in many national manufacturing policies and advanced manufacturing R&D strategies responding to the ‘next production revolution’ are: convergence, scale-up and paying increased attention to national economic value capture from manufacturing innovation. Many future high-value products and manufacturing systems will depend on a range of technologies, such as advanced materials, nanotechnology, biotechnology and novel ICT. The combination and integration of these technologies has the potential to enable a range of new applications and new markets. Some of the most potentially disruptive technologies are based on convergence between science and engineering research domains. Quantum technologies - combining digital IT and advanced materials - and synthetic biology - combining digital IT and biosciences - are both examples of convergence. Convergence is also occurring between manufacturing systems, and industry sectors. It is the convergence between all of these technologies and systems that is likely to drive the next production revolution. In designing advanced manufacturing research programmes and initiatives, policy makers need to be aware that convergence is opening new manufacturing R&D opportunities and challenges, with increasing scope for innovation in manufacturing and more diverse ways in which value can be captured from it. The European Commission’s research programmes addressing ‘multi-KETs’ (multiple key enabling technologies) are examples of explicit efforts to pursue new manufacturing R&D opportunities driven by convergence. The system complexity and relative immaturity of many of the key technologies driving the next production revolution also pose significant challenges for the manufacturing scale-up and industrialisation of new products. These converging technologies may be integrated in ways that offer new product functionalities and/or improved performance. However, it may be difficult to maintain these features during production at industrial scale using conventional manufacturing tools and processes. Policy makers need to be aware of the manufacturability challenges associated with the scale-up of disruptive science-based technologies, which may require new R&D-based solutions and novel tools, production technologies and facilities. Investments in applied research centres and pilot production facilities focused on taking innovations out of the laboratory and into production are common approaches to tackling these challenges. The attention given to scale-up is likely to increase due to the competition and the pace of technological change which is creating a sense of urgency among policy makers. They are seeking to reduce the time between R&D-based discovery and the deployment of advanced manufacturing innovations and to facilitate rapid scale-up and market penetration of advanced manufacturing technologies in industry. This in turn is driving the need to demonstrate more efficiently the technical feasibility and manufacturability of products embodying novel technologies. The need to bridge the gap between knowledge generation and the commercialisation of advanced product and manufacturing-process innovations is high on the international policy agenda. Some of the UK’s Catapult Centres, for example, were established to address scale-up challenges in areas such as high-value manufacturing, cell therapy and satellite applications and increase the scale, speed and scope of commercialisation. The Catapult network has been earmarked for a ‘growing role’ in helping to commercialise new and emerging technologies under the UK government’s new Industrial Strategy. Unsurprisingly, many OECD countries are looking to the next production revolution for new opportunities for value capture. For instance, there is interest in hybrid production technologies and systems able to produce customised products at mass production prices. Increased automation and the application of advanced ICT across manufacturing systems, together with the convergence of manufacturing technologies are offering new possibilities to increase factory productivity and reduce the length of supply chains. New production technologies that combine multiple production steps can, for example, significantly reduce production times. Hybrid machining centres are a good example of this; they can perform laser heat treatment in addition to a machining process during the same operation, vastly reducing changeover times. There is also considerable interest in the potential of internet-based businesses to capture value from the online delivery of goods and services and the interactions with customers. Such approaches are particularly important in the context of the growing demand for individualised products and may allow certain high-value production activities to be retained in high-wage economies. Germany’s Cluster of Excellence Integrative Production Technology for High-wage Countries, for example, is looking at a combination of approaches that will make it possible to keep German high-value manufacturing operations at home. The next production revolution is likely to be characterised by the convergence of technologies, the integration of industrial systems, and the blurring of traditional science and engineering R&D domain boundaries. In this context, manufacturing research and innovation may also change significantly. Government-funded manufacturing R&D institutions and programmes around the world are responding to these changes in a number of ways, including increased attention to innovation-related activities beyond basic R&D. We are seeing a greater focus on prototype demonstration to technology developers, application demonstration to users, skills training and workforce development and supply chain development. There seems to be increasing investment in shared research and innovation spaces such as demonstration facilities, pilot lines and test beds of various kinds. There is also an increased focus on ‘grand challenges’ with R&D on topics such as sustainable manufacturing, nanomanufacturing and energy storage. In summary, there appears to be growing consensus that a new manufacturing revolution is coming. New converging technologies and integrated application systems are radically altering not only how we make things and how services are delivered, but also – critically for the manufacturing and engineering management research community – how we carry out manufacturing R&D. Many governments are looking to ensure national competitiveness by developing new types of R&D programmes and institutions expressly to facilitate the rapid scale-up, demonstration, diffusion and deployment of ‘next production revolution’ technologies. From Research to Economic Impact: Designing Modern RTO Strategies, 12–13 April 2018.